If an individual participates in a form of exercise that they are unaccustomed to, it may lead to muscle soreness and as expected, athletes are familiar with this kind of phenomenon. Delayed onset muscle soreness can be categorized as acute or delayed-onset, depending on when it occurs in relation to the time of the exercise. Acute soreness is felt during the final stages of the exercise and has been attributed to the accumulation of metabolic waste products and insufficient blood supply to the muscles. Delayed onset muscle soreness (DOMS), however, is muscle pain and soreness that occurs 24 to 72 hours after unaccustomed exercise. The pain and soreness usually peak at 48 hours after exercise and subsides within 5-7 days after exercise. While it is a symptom of exercise-induced muscle damage, DOMS doesn’t necessarily indicate muscle damage. The extent of DOMS also does not correlate to the extent of muscle damage. The risk of developing DOMS (delayed onset muscle soreness) is greatest when the exercise involves eccentric muscle activity. Eccentric muscle activity is when force is being applied by the muscles are they are extending. A typical example is the latter phase of bicep curls, where the dumbbells are lowered while still keeping the biceps contracted; hence the muscles are adding resistance to the downward movement. It is also the same activity that occurs during a descent of stairs; the thigh muscles apply force while lengthening which helps to decelerate the body as it goes down. Concentric muscle activity, on the other hand, is when the muscle applies force as it shortens; this is the case during the upward movement phase of the bicep curls. It is also seen in the thigh muscles as one goes up a flight of stairs. Isometric muscle activity occurs when the muscles apply force without changing length. It the predominant mode of muscle action as one maintains a posture and is commonly seen in yoga exercises. Eccentric activity is known to cause the most muscle soreness; concentric is second to eccentric up to 24 hours after exercise, but both concentric and isometric cause about the same degree of soreness 48 hours after exercise. DOMS causes a reduction in athletic performance and range of motion. This may lead to changes in how the muscles are put to work when performing activities; there might be a recruitment of muscle groups, ligaments, and tendons that are not usually involved or an increase in involvement due to insufficient strength in the muscles that usually take part. If such changes in the pattern of movements are not corrected before returning to sports, it may lead to further damage. Lactic acid theory – this theorizes that DOMS is caused by a production of lactic acid even after exercise. There are, however, many challenges to this theory, especially because the peak of lactic acid production does not correspond with the peak of DOMS. Connective tissue damage theory – this theorizes that DOMS is caused by damage of the connective tissue, such as the tendons that connect muscle to bone. The collagen in these tissues contains a high amount of hydroxyproline (OHP) amino acid, which is released when it’s broken down. There is a presence of OHP found in eccentrically active muscles, which peaks 48 hours after exercise and hence coincides with the peak of DOMS symptoms. Muscle spasm theory – this theory relates the pain to muscle spasms, which is known to cause pain from the involuntary muscle contractions. It was found that the electromyography (EMG) signal increased for a resting muscle that had just engaged in an eccentric activity. EMG has long been established as a method for detecting muscle spasms. 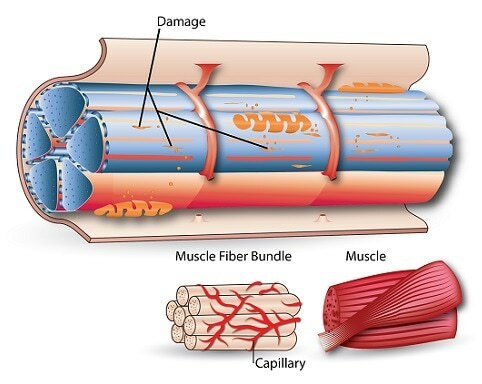 Torn Tissue or Muscle Damage theory – in this theory, the muscles sustain micro-damages. It is supported by many biopsy studies. Enzyme Efflux theory – this theory is supported by increased catalytic protein (also called enzymes) activities such as creatine phosphokinase (CPK) which has been found to increase due to muscle damage. CPK peak levels, however, do not always correspond with the peak of DOMS. No single factor has been attributed as the cause of DOMS and it is likely that DOMS is caused by more than one factors. There are challenges presented against the lactic acid and muscle spasm theories, while the muscle damage and connective tissue damage theories are most widely accepted. Muscle pain. Within 24 hours after exercise that one is not accustomed to, there is a gradual onset of muscle pain and soreness which peaks at 48 to 72 hours and dissipates by day 5 to day 7 after exercise. Pain can range from mild to severe discomfort where it restricts normal movement. Muscle tenderness, this would be elicited by palpation of the affected muscles. Muscle stiffness may occur before pain begins. Muscle weakness that begins before muscle soreness and may last up to 2 weeks. DOMS (delayed onset muscle soreness) is not usually a serious condition that needs medical attention. In order to prevent DOMS, new exercise programs should be approached progressively in the first 1-2 weeks. Exercise has been found to be the most effective means of alleviating pain from DOMS. Non-steroidal anti-inflammatory agents (NSAIDs) have also been found to have a dose-dependent effect; however, exercise has been found to be more effective. Massage has seen varying results, depending on the time of application as well as the technique used. One study reported a significant decrease in DOMS when massage was applied 2 hours after eccentric exercise. Warm up exercises and keeping hydrated have also been suggested to help prevent the risk of DOMS. Stretching, cryotherapy, homeopathy, ultrasound and electrical current have been found to be ineffective. Ryschon, T. W., Fowler, M. D., Wysong, R. E., Anthony, A., and Balaban, R. S. (1997) Efficiency of human skeletal muscle in vivo: comparison of isometric, concentric, and eccentric muscle action, J Appl Physiol (1985) 83, 867-874. Cheung, K., Hume, P., and Maxwell, L. (2003) Delayed onset muscle soreness: treatment strategies and performance factors, Sports Med 33, 145-164. Gulick, D. T., and Kimura, I. F. (1996) Delayed Onset Muscle Soreness: What Is It and How Do We Treat It?, Journal of Sport Rehabilitation 5, 234-243. Taverner, D. (1954) Muscle spasm as a cause of somatic pain, Ann Rheum Dis 13, 331-335. Sethi, V. (2012) Literature review of Management of Delayed onset muscle soreness (DOMS), International Journal of Biological & Medical Research 3, 1469-1475.